After years of fierce community opposition, Competitive Power Ventures (CPV) announced on October 1, 2018 that their fracked gas power plant in Orange County, New York is in operation. On Monday, Sane Energy joined our allies at Beyond Extreme Energy in Washington D.C. for the Crack FERC Open action where two bamboo 15 foot tall “fracked gas drilling rigs” with protesters locked inside were set up to blockade the entrance in front of the Federal Regulatory Energy Commission (FERC) building to prevent business as usual to operate. Action Alert! Save Community Solar! Right now, community solar projects throughout New York are being hurt by the State's complicated pricing scheme called VDER, shutting everyday New Yorkers out of the market. If we don’t act quickly, New York could lose billions of dollars worth of solar project investment and jobs in the solar energy sector. On April 23, the day after Earth Day, over 1500 New Yorkers rallied and marched in Albany to call on New York’s Governor Andrew Cuomo to show real climate leadership. That’s it, we’re storming the castle. On April 23, thousands of New Yorkers are showing up at Gov. Andrew Cuomo’s front door in Albany to demand genuine action on climate change. We’re not going to bus up just to go “rah-rah-rah” on the steps of the statehouse for the press and going home. We have three specific demands: halt of all fracking infrastructure now, a just transition to 100 percent renewables, and make corporate polluters pay into a transition fund. This morning, Governor Andrew Cuomo vetoed Port Ambrose, the contested marine project that has threatened a prime offshore wind lease area with a proposal to install a liquefied natural gas facility off the shore of New York and Long Island. Advocates from Sane Energy Project and All Our Energy celebrated the announcement. New York City Council Member, Donovan Richards, was a lead champion on defeating Port Ambrose. Sane Energy Project attended the announcement, where Governor Cuomo thanked local officials and "the advocates," whom he said have fought "for years." Among his objections to the project, he cited super storms, risks to fishing industries, and security concerns. "We know that NY is at the top of terrorist targets." The governor also noted the conflict between the LNG port and the wind farm, saying, "There was no thought given to how the two projects could coexist." Long Island's stellar beaches also figured large in his decision: "I came over by helicopter from the north, and these beaches are one of the great treasures of the state of New York–an international gem– when you see that strip of sand, there's nothing like it." The Governor closed by saying, "It was not worth the risk and we're going to veto Port Ambrose," to loud and sustained applause. Assembly Member Todd Kaminsky, who has been a tireless leader against this project, thanked the governor for, "Understanding that renewable energy is not something we want to get in the way of." 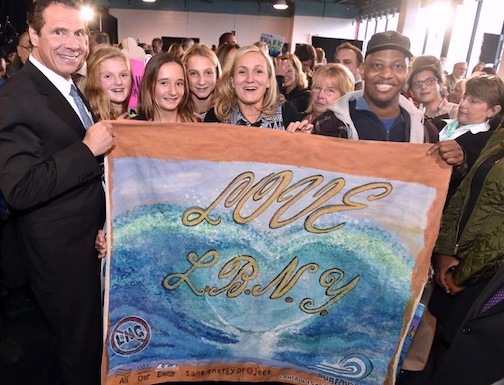 The Assemblyman then presented Cuomo with one of the famous "Polar Bear" sweatshirts, explaining, "We have a tradition in our town every Super Bowl Saturday, where we run into the ocean, and if you're going to protect Long Island, then you, Governor, are also a Long Beach Polar Bear!" As a member of the wide coalition that has fought this project for the past two years, Sane Energy Project applauds the governor's action, and wishes to thank the hundreds of advocates and dozens of elected officials who opposed this project and brought their considerable influence to bear. One cannot underestimate the importance of two local resolutions, one in the City of Long Beach, spearheaded by Council President, Anthony Eramo, and the New York City Council Resolution, sponsored by then-Chair of the Environmental Committee, Donovan Richards, as well as the State Legislative sign-on letter, organized by Senator Brad Hoylman and Assemblymember Linda Rosenthal, and co-signed by more than 50 colleagues. The leadership of multiple bi-partisan County, Town, State representatives, and even federal Congresswoman, Kathleen Rice, hosted numerous community forums, press conferences and events in Long Island and the Rockaways, and have been a powerful force leading to this decision. And the people power of everyone who signed postcards and petitions, called their councilperson, attended rallies, testified at hearings, held hands on the beach, painted banners, printed tee shirts, and told their friends about this insane project, is what impresses us the most. Thank you for everything you did to stop this project; you are the real leaders here. Combined with recent statements by both the director of BOEM (The Bureau of Ocean Energy Management) and NY State Energy Czar, Richard Kauffman, this death knell for Port Ambrose opens the real possibility to develop the long-awaited project previously known as the "Rockaway Wind Farm" and now called the "Long Island - New York City Offshore Wind Project," a partnership of Con Ed, LIPA and NYPA. The postcards we had printed to ask for the Governor's veto will now be used to THANK him; please pick up a handful at any of our upcoming events. "Risk not worth the reward." Makes room for wind power. "Yeah, that’s when I worry." This is it–Today begins the final phase of the review of Port Ambrose LNG. In case you missed any of the newsletters, facebook posts, or events building up to these hearings that have been happening over the last several months, below is a handy round up of the info you need to respond. We've also included a photo album of just a FRACTION of the effort that has gone into stopping this project over the past two years. Our heartfelt thanks and gratitude to all the thousands of volunteers who have taken part in the rallies, art builds, postcard campaigns, petition drives, beach leafletting, community meetings and more, and to the elected officials who have shown leadership on this issue. It ain't over yet, we have until December 21st to get a veto on this, so stay tuned for what comes next after the hearings! The New York hearings are tonight and tomorrow night, Nov. 2nd and 3rd, in Long Beach, NY, from 6-10pm each night. Long Beach is easily accessible by public transport and there are buses leaving Manhattan later today as well. Click here for a summary of all the transportation, talking point and other hearing details. Don't forget to pick up a handful of our new postcards to mail to Governor Cuomo, because his 45-day window to veto this project begins Friday, Nov. 6th, and we'll be keeping up the drumbeat after the hearings, including vigils in front of his NYC office. Please check in at our Facebook page for the late-breaking news and announcements, and for photos from the hearings. We'll see you there! Volunteer plans a 400-mile Climate Ride for Sane Energy! When we learned that our pal, Lorna Mason, was planning to do the nearly 400-mile cycle from Bar Harbor to Boston, we were mighty impressed. After all, that's like biking from Manhattan to Montauk – 4 times! When she then said she planned to do it to benefit Sane Energy Project, we were floored. It's a privilege to be honored by such an amazing and fierce climate warrior. The Climate Ride is an annual event that brings attention to the warming of the planet, and the particular ride she will do, along the northeast coastline that is threatened by sea level rise, pipelines, LNG ports and tanks, and already suffering the effects of ocean acidification, has particular meaning for us, as one of the founders of the Northeast Pipelines Alliance. We met Lorna at another group we helped found, the NYC Grassroots Alliance. As a member of the Zen Center of New York City and its Earth Initiative, Lorna invited Sane to come speak at Zen Center about Port Ambrose LNG, and soon their members were writing letters, sending postcards and attending hearings to try and stop the project. The latest iteration of this community partnership is Climate Ride Northeast. Says Lorna, "I ride my bike a lot around NYC, and I long for the day when ALL car drivers respect riders and when the cars they drive don't emit any toxic exhaust. And really that day doesn't need to be far off. Clean energy solutions are already available, we just need to create the political will to get us there. That's why I am riding in the Northeast Climate Ride and raising money for Sane Energy Project. I've been aware of Sane for the last couple of years and have been amazed by their fearless and intelligent pursuit to end fracking and the infrastructure that supports it, as well as their grassroots organizing to bring us a 100% sustainable energy future." Climate Ride Northeast begins on September 17th in iconic Bar Harbor, Maine, then heads south through Acadia National Park, and along Maine's rocky coast, dotted with quaint harbor towns, lighthouses, and wild blueberry patches. The next two days are spent pedaling along Maine's Mid-Coast region with a stop in Portland. The fourth day pedals from Kennebunk to New Hampshire's 18 miles of scenic shoreline before the final day: A beautiful ride into Boston, Massachusetts where riders will retrace, in reverse, Paul Revere's famous midnight ride of 1775. ("Climate change is coming!") Join us in Boston on September 21st to greet Lorna and all the Climate Riders as they arrive! Please support Lorna and follow along as we post about her training from now until she leaves for Maine! This is a great cause; 100% tax deductible donations can be made here. About half the funds received will go to cover support for all the cyclists and the great work that Climate Ride does year-round; the rest will go to Sane Energy Project to support our climate work. Sane Energy Co-Director Kim Fraczek was honored as a Climate Hero by the Human Impacts Institute, along with many of our heroes, such as Wendy Brawer of Greenmaps, at a gala at the French Consulate. Kim also recorded a session with Green Gotham that will air later this summer. Outreach this month moved outdoors and out of the city: We hosted a Port Ambrose orientation at Patagonia, then hit the beaches to leaflet along the south shore of Long Island. We spread the word about infrastructure at Clearwater weekend with our friends fighting the Constitution and AIM pipelines. YOU ARE HERE presentations in Staten Island and Orange County covered a wide range of upstate issues as well as Port Ambrose. A group of allies presented NYSERDA with a report card even when they cancelled their public meeting on the state energy plan last minute. We returned a second time for the rescheduled hearing and are evaluating the now-released plan. Final report card forthcoming. We ended the month by co-hosting a roundtable on offshore wind with our friends from Citizen Action, bringing together more than three dozen folks from around the state to talk about how to support the development of a renewable energy industry that could benefit the entire state. Jane's Walk, an annual event by the Municipal Arts Society, kicked off the month. This year's walking tour was hosted by a variety of art and artists from the new Whitney museum, and ended at the back door of the museum, on top of the pipeline vault, in a tug of war between Spectra execs and Jane Jacobs herself. May 14th saw the passage of the NY City Council resolution against Port Ambrose that we all worked so hard for, as well as the introduction of the Indian Point resolution. Complete story here. May also saw work begin on America's first offshore wind farm, the so-called "Rhode Island Project" (which will eventually supply wind power to both Long Island and New England). This pilot project is crucial to the development of wind power on the east coast. Josh Fox and Lee Ziesche's travelogue highlights a different map each week. The YOU ARE HERE map was featured as the Map of the Week in May. The map has 137 "dots;" with each dot opening a pop-up box that explains the infrastructure project at that site, and links to the local group fighting it. As Josh and Lee note, "We’ve toured to many of those dots and have seen the strength of the communities there." Stops along the tour that are points on the map: Seneca Lake, where Josh was recently arrested; Wawayanda, near Middletown, where they attended a rally against the CPV power plant; and in Schoharie County when the Solutions Tour highlighted the Constitution pipeline fight. As Lee says, "If these projects are allowed to continue, it’s game over for our planet–meaning whether there is an infrastructure dot over your house or not, we are all here." We made presentations about shale gas infrastructure to the Village Independent Democrats, the Hudson Guild, Rockaway Wildfire, and Sustainable Warwick. Our travels took us to Long Beach, Rockaway, and City Hall fighting Port Ambrose; to Tarrytown for the NRC Indian Point hearing, to Rosendale to work on the Pilgrim Pipeline; and to Syracuse to teach artivism. We took part in Surfriders' Hands Across the Sands event, which was focused on stopping Port Ambrose and offshore drilling. Finally, over the Memorial Day weekend, to prep for the FERCUS rally, Kim led a team to paint a 50-foot banner that was used to blockade FERC and is now touring the region with various activist actions. Click here to see the complete photo set of the FERCUS art build. The month started with the City Council hearing on Port Ambrose where Sane Energy Project presented a 4-part power point. 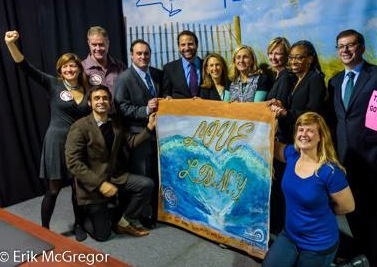 The Port Ambrose campaign continued with lots of postcard writing events, rallies, and a town hall presentation in Oceanside where a banner painted by local teens had its debut. We had a bird dog rally at Governor Cuomo's Harvard Club fundraiser on April 13th, demanding he veto Port Ambrose. The April 21st rally at his Manhattan office, part of the three-day Rising Tide action, was a huge success, with a Port Ambrose tanker squaring off against wind turbines. Co-Director Patrick Robbins was interviewed at the rally for Democracy Now. A lot of action was generated around the Spectra site in the West Village, where the opening of the new Whitney Museum was another chance to bring attention to the infrastructure build out in NYC and to what's at the other end of the pipe. Meanwhile, Clare Donohue demonstrated the YOU ARE HERE map in a webinar on fracktivist tools hosted by the Halt the Harm network. Kim helped Riverside Church prepare artwork for an Earth Day mass, and we took part in the Earth Day Fest at Union Square and at a City College improv performance. The month ended with the NECOS conference, bringing together climate and pipeline fighters to Massachusetts from all over the Northeast. The tragic gas explosion in the East Village was a reminder how devastating any gas accident can be and why we should be rapidly replacing our city's aging infrastructure with renewable energy. Our statement on the explosion here. Kim presented at both the Shale Justice Convergence and Shale Justice Spring Break in Pennsylvania, and was invited to lead an activist art forum at Pratt Institute. Patrick presented about Port Ambrose at the Island Park and Baldwin Civic Associations as well as the Long Beach Chamber of Commerce, and the Manhattan Young Democrats. And another YOU ARE HERE presentation went off in Spencer, NY. The press conference announcing the Port Ambrose resolution was covered by Newsday, the Long Island Herald, and NY1. See the Reportback for January and February here, and the media round up for April through June here. Port Ambrose Reso is Out of Committee! MOMENTS AGO, Resolution 549, asking Governor Cuomo to veto Port Ambrose, passed in a vote held by the NY City Council Committee on Environmental Protection. That means it will now go to a floor vote at Thursday's main City Council meeting! We're up to 30 cosigners now! Well ahead of the 26 signers needed to pass the measure, but can we get that number even higher? Please join us at City Hall Park at 12 noon on Thursday for a pre-meeting event. We'll greet council members as they arrive to thank those who have already signed on, and encourage the rest to vote YES on Reso 549! Please gather at both the east and west entrances of City Hall plaza; look for Kim, Patrick or Clare when you arrive. Please bring photo ID to gain entrance. We'll ask you to hold thank you signs and greet the council members as they arrive, so bring your biggest smile! We'll go inside when the meeting starts (at 1pm) to watch the Reso get passed! MORE LEGISLATIVE GOOD NEWS: Last week, the anti-TPP Resolution passed in the Council. PLUS, a resolution to shut down Indian Point will be introduced on Thursday as well. Given the fire this past weekend, that couldn't come a minute too soon. Don't miss this important day at City Hall––see you Thursday! Here at Sane Energy Project, we feel strongly that offshore wind is what New York ought to be building right now, not short-sighted and damaging fossil fuel infrastructure that will impede the development of renewable energy. Here is the powerpoint we presented at the City Council hearing on Resolution 549 on April 1st, 2015. It's a PDF so please be patient while the link loads. What was it and what you missed: The hearing is a step along the process of bringing Resolution 549 to a floor vote with the entire City Council. The reso asks Governor Cuomo to veto Port Ambrose, and will be an important signal from his downstate colleagues and voters. The hearing was jointly held by the Committee on Waterfronts, chaired by Deborah Rose from Staten Island, and the Committee on Environmental Protection, chaired by Rockaway Councilman Donovan Richards. We hope it will come to a full-council vote next month (we'll alert you when the date is confirmed) but right now we still need to get 12 more signers (here's who to call). The balance of speakers were in support of the resolution, highly informed, and covered a range of topics from economic to environmental. Bruce Ferguson from Catskill Citizens explained the economic unfeasibility of the project, pointing out that LNG imports are down 90%; Jose Soegaard of Metropolitan Waterfront Alliance noted the issue of "entrainment" (vast amounts of sea water being sucked up by the ships, which kills millions of marine larvae and eggs); and Cindy Zipf of Clean Ocean Action discussed the invaluable ecosystem that is the NY/NJ "Bight," with 5 of the only 7 species of sea turtles in the world making our area their home. The League of Women Voters, a non-partisan group that held a forum that included a Liberty rep, spoke of the terrorist risks of Port Ambrose. Anthony Rogers-Wright noted the skewed Rockaway census data used in the dEIS, which failed to count Hispanics as minorities, thereby avoiding a more stringent assessment required for Environmental Justice communities. Many of these issues were detailed in an open letter to Bronx council members (none have yet signed on to Reso 549) written by Bronx Climate Justice North and published in today's Riverdale Press. Many others spoke eloquently (see photos below) and then there was a song performed in lieu of spoken testimony (a first, as far as we know, in Council Chambers) which caused everyone in the room (including at the dais) to whip out their cell phones. We'll post the video of the full proceedings as soon as it's available. We've been to quite a few public hearings at this point, but this may be the first time we would describe the experience as "fun." The New York City Council, at this point in time, just might be the most progressive elected body in the country, especially the Committee on Environmental Protection, chaired by Councilman Richards. Compared to the dictatorial and top-down manner of the prior administration, this Council is out to change things up, operating in a way that is radically different, astonishingly open, even downright joyful. It's not quite an OWS meeting, but the committee does encourage use of Occupy-style "twinkle-up" approval signals at hearings, rather than disruptive applause. And when Councilman Corey Johnson spoke, he mentioned his arrest at the Spectra Pipeline (along with a few Occupiers). This ain't your grandpa's Council. The open and engaging style of this committee at first came as a bit of a shock to anyone used to the old guard, beginning with Councilman Richards inviting advocates to a roundtable meeting at the start of his term, asking what was on their minds, and reviewing suggested initiatives. Combined with participatory budgeting, this is a rare opportunity for the public to get involved in our own democracy. Port Ambrose is just one issue but we are impressed with the responsiveness this council has shown thus far. The resolution is one of the initiatives we asked for at the roundtable; now it's making its way through the City Council! Every time we encounter council members, they are calling for renewables and an end to fossil fuel addiction. They seem to want the future we want. Whatever issue is close to your heart, we highly recommend jumping into civic participation; now is the time. Plainly put, if you're not engaging with this city council, at this time in history, you're missing all the fun! Clock Stopped on Port Ambrose! 1) The volume of dEIS comments to review (That's because of what YOU did--62,000 comments!) 2) Analysis related to pipeline burial depth and the Clean Air Act is still needed before the Environmental Impact Statement (EIS can be finalized. 3) Financial data that Liberty is supposed to submit is due before MARAD can make its final decision. This is the second time the clock has been stopped, and it is unclear for how long. The delay may push the release of the final EIS back to July, and could push the 45-day veto period well into the summer. That's great for us, because there's nothing we like better than beach leafletting, and there's nothing that beach goers like less than LNG! Meanwhile: Momentum that can't be stopped! 1) SUPPORT FROM STATE OFFICIALS. There's already been terrific bi-partisan engagement. 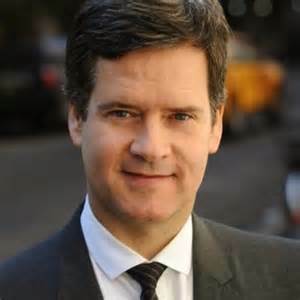 Now, the Rosenthal/Hoylman letter, signed by 52 state legislators, has been sent to Cuomo! 2) SUPPORT FROM CITY OFFICIALS. We need 35 votes to pass City Council Resolution 549, requesting Governor Cuomo to veto Port Ambrose. We're already more than halfway there! Currently there are 19 co-signers, and we need 16 more. Here's who still needs to sign on. 3) PUBLIC SUPPORT. Cuomo needs to hear not just from other electeds, but from citizens all over the state. Take part in the postcard campaign that's been going on: Let us know if you can host a postcard-writing party! Turn Your City Council Rep onto Reso 549! Goal: 35 City Council votes for the Port Ambrose resolution! Chair of the Environmental Committee, Donovan Richards, has written an important resolution opposing Port Ambrose and calling on Governor Cuomo to veto it. The public hearing for this resolution will take place on Wednesday, April 1st. As advocates, we need to support this action by getting at least 35 council members signed on. Let's do that by the April 1st hearing! Here's a running count of who's signed on and who hasn't. Please check if your rep has signed on already; if they have, thank them! If not, CALL THEM (or write to them using use the email address and sample letter provided). Background: The City of New York has no official jurisdiction over Port Ambrose, despite it being proposed off our shoreline, however, Governor Cuomo DOES. He can veto it and stop this project cold. To convince him to do so, bi-partisan calls from state and local electeds have been pouring into his office. Now we need Mayor De Blasio to come out against the Port. The Mayor needs to hear a strong message from City Council, so we want massive support for this reso from across the city. So far 15 Council Members have signed on to support the reso, but we need 20 more YES votes to pass it! What to do: • Check here to see if your council member has signed on yet. If they have, please call their office and THANK THEM for doing so! • If they haven't, please call or send them a letter (sample here) asking them to sign on before April 1st. • Send a message to Mayor De Blasio asking for HIM to call on Governor Cuomo to veto Port Ambrose. • Attend the April 1st hearing and testify! Council Chambers at City Hall (inside City Hall park); rally at noon, hearing at 1pm. Photo courtesy of Martha Cameron. Successful Close of Comments on Port Ambrose! Yesterday was the final day to comment on Port Ambrose and nearly 62,000 comments were filed opposing it! A successful press conference on the steps of City Hall (photos below) featured NYC Comptroller Scott Stringer, Councilmembers Donovan Richards and Cory Johnson, affected frontline community members from the Rockaways and Long Island, student reps from NYPIRG and NYC advocates. The story was covered by NY1, News12 Long Island, WNYC, Newsday, and Capitol New York, which reported, "The drumbeat against the facility, a floating offshore loading station in the waters between New Jersey and Long Island, started in living rooms and union halls on Long Island and has gathered mainstream political support. The state's potent anti-fracking movement is also using its network of activists to fight the plan." What's next? Focus on Cuomo! April 1st, City Council hearing and rally: Council Member Donovan Richards will host a public hearing on his Port Ambrose resolution. Join us for a rally ahead of the hearing and to testify. Let’s pack the room to overflowing! (Rally at noon, hearing at 1pm at City Hall, Council Chambers.) Help us get enough City Councilmembers signed on to pass this reso before the hearing! April 13th, Bring our message straight to Cuomo: Join us outside a fundraiser luncheon at the Harvard Club, 27 West 44th Street, from 11:15 til 1pm, to ask the Governor to veto Port Ambrose!